On September 29th, at 8pm, the twelfth edition of the Night walk “Ratpenat” organized by the Cyclist club of Roses will take place. This year the edition of the march will be entirely on foot and will travel several roads of the area between Mas Oliva, Las Arenas, Puig Mirat and Can Palou urbanization with a total of 10 kilometers and 190 meters of accumulated positive difference. 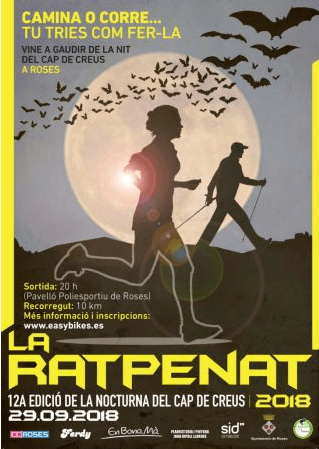 Arrival is scheduled for 23:00 at the same starting point, the Municipal Polivalent Track of Roses. The inscriptions of the race can be made in advance until September 27th at the website www.easybikes.es or after 6:30 pm on the same day of the race.